Cancer.gov through the National Cancer Institute at the NIH offers an overview for every type of head and neck cancer, along with fact sheets, treatment options, research information, causes, prevention, statistics and coping resources. Answers the question “what is head and neck cancer?” and discusses symptoms, diagnoses, treatments, side effects, and follow-up care. This is a good starting point for anyone who is newly diagnosed. This PDQ gives a broad overview of Hypopharyngeal Cancer. Here you will find information on staging, recurrence, treatment options for initial and recurrence of cancer based on stage, approved drugs, and complications. Easy to understand anatomical graphics illustrate the structures being discussed. This PDQ gives a broad overview of Laryngeal Cancer. Here you will find information on staging, recurrence, treatment options for initial and recurrence of cancer based on stage, approved drugs, and complications. Easy to understand anatomical graphics illustrate the structures being discussed. This PDQ gives a broad overview of Lip and Mouth Cancer. Here you will find information on staging, recurrence, treatment options for initial and recurrence of cancer based on stage, approved drugs, and complications. Easy to understand anatomical graphics illustrate the structures being discussed. This PDQ gives a broad overview of Metastatic Squamous Neck Cancer. Here you will find information on staging, recurrence, treatment options for initial and recurrence of cancer based on stage, approved drugs, and complications. Easy to understand anatomical graphics illustrate the structures being discussed. This PDQ gives a broad overview of Nasopharyngeal Cancer. Here you will find information on staging, recurrence, treatment options for initial and recurrence of cancer based on stage, approved drugs, and complications. Easy to understand anatomical graphics illustrate the structures being discussed. This PDQ gives a broad overview of Oropharyngeal Cancer. Here you will find information on staging, recurrence, treatment options for initial and recurrence of cancer based on stage, approved drugs, and complications. Easy to understand anatomical graphics illustrate the structures being discussed. This PDQ gives a broad overview of Paranasal Sinus Cancer. Here you will find information on staging, recurrence, treatment options for initial and recurrence of cancer based on stage, approved drugs, and complications. Easy to understand anatomical graphics illustrate the structures being discussed. This PDQ gives a broad overview of Salivary Gland Cancer. Here you will find information on staging, recurrence, treatment options for initial and recurrence of cancer based on stage, approved drugs, and complications. Easy to understand anatomical graphics illustrate the structures being discussed. This PDQ briefly discusses ways to avoid oral cancer as well as provides links to quitting smoking. Memorial Sloan Kettering Cancer Center offers this site for overview of symptoms, quality of life, and emotional support. This PDQ discusses the various screening tests currently being used to diagnose oral cancer. It also looks into the possible risks that some of the tests pose. Resources for oral health for people going through radiation and chemotherapy for head and neck cancers. Clinical trial listings and openings. This site offers downloadable patient guides, mobile apps, explanations of personalized medicine, and advocacy, support, and palliative group information. One of the largest international departments for the treatment of Head and Neck Cancer, this link provides information on the different types of cancer and focuses on rare cancers and their treatments. This link explores different ways to cope with cancer. Discussion includes topics of feelings and adjustment to the diagnosis, self-image and sexuality, day-to-day life, coping topics for the family and friends of a cancer patient, and survivorship. The Head and Neck Cancer guide is a resource for patients and their families that discusses types of head and neck cancer, treatment options, and both the physical and emotional journey that a cancer diagnosis takes you on. This site allows patients to create their own guidebook and share it virtually with the ones they love. This site also provides discussion on difficult topics such as end of life decisions. This site is a message board/forum and blog for patients. This is a non-profit support network that offers support groups and educational programs, recipes, survivor tips and topics to discuss with your physician. This is an international organization. The Oral Cancer Foundation provides resources in the forms of education, support, community, survivorship, insurance assistance, hospital ratings, and screenings. The Head and Neck Cancer Alliance is available to help with financial needs of patients, as well as offer assistance in linking patients with other financial resources that fit their individual needs. A listing of European patient support organizations for rare cancers including Head and Neck and Colorectal Cancers. Many items on this link are not patient-relevant. However, there are a number of good videos and articles regarding World Head and Neck Day. The American Cancer Society detailed guide for oral and oropharyngeal cancer. This guide offers information on anatomy, causes, risk factors, prevention, detection, diagnosis, staging, and treatment. Also lists questions to ask your physician and what to expect during and after treatment. Link takes you to the European Head and Neck Society campaign homepage aimed at raising awareness for head and neck cancers. 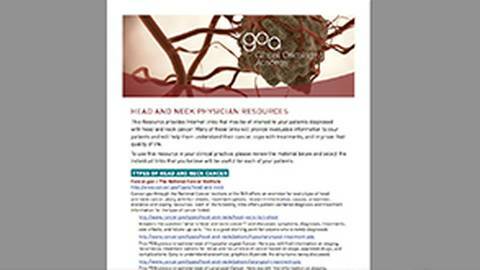 Offers information on head and neck cancers, white pages, videos, and other patient resources. This link also provides real-life patient stories, community awareness events, petitions, and contacts. This link has information on early diagnosis support and also links back to the Make Sense Campaign. This article discusses the anatomy of the head and neck, causes and risk factors of head and neck cancer including its link to HPV, symptoms, diagnostics, tumor staging, therapies, and aftercare. This society was designed to advance the knowledge and awareness of head and neck cancers. The site has links to current news articles. A simple listing of contact information for head and neck cancer resources. An international listing of head and neck cancer resources ranging from research articles, cancer societies, listservs, and publisher clearinghouses. This resource provides Internet links that may be of interest to your patients diagnosed with head and neck cancer. Many of these links will provide invaluable information to your patients and help them understand their cancer, cope with treatments, and improve their quality of life.